The coffee plant is actually a tree. However, as the coffee cherries are difficult to harvest at the height of a fully-grown 30-40 foot tall tree, the plants are kept at the level of bushes. A mature coffee plant of 6-9 feet bears around 11-17 pounds of coffee cherries per year, which will yield anywhere between 1-5 pounds of dried beans. The soil, climate, altitude, and surrounding plants that a coffee tree is exposed to during growth affect the flavor and amount of beans it produces. A tree provides maximum yields after 6 to 8 years. Coffee beans are the seeds of the coffee cherry. While most coffee cherries contain two beans, 5 to 10% of the time, only one bean is produced in the cherry. This is called a "peaberry." 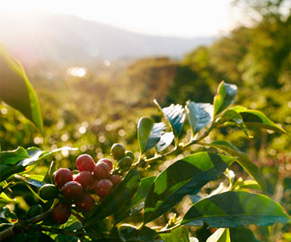 Approximately 25 million acres worldwide are devoted to cultivating coffee with the ideal climate being that of tropical and sub-tropical regions.